Known for its breathtaking red rock views and friendly atmosphere. 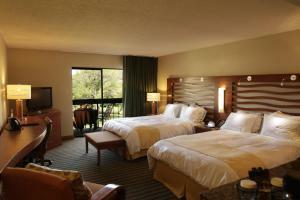 Poco Diablo Resort is one of Sedona s finest resorts. Just 2 miles from the heart of Sedona. this charming resort is set amidst lush landscaping. sparkling ponds. trickling streams. green willows and tall pines. Guests can enjoy amenities such as our 9-hole executive golf course. full fitness facility. swimming pool. Jacuzzi. tennis courts and relaxing therapeutic massage. Dine at T. Carl s Restaurant with its scenic indoor or outdoor dining and exceptional cuisine. The 10th hole is a local favorite for a relaxing cocktail. a casual meal or big screen sports entertainment. The resort is the perfect destination for your next retreat. meeting or event. With 8500 square feet of meeting and catering space with indoor and outdoor venues with stunning views for that special event. Pet Sitting / Dog Walking in Sedona, Arizona. If you are the owner of a Pet Sitting or a Dog Walking business in Sedona, Arizona and wish to add your business listing free of charge to this city please submit your info here.